Banana is one of the most popular fruit on the planet. Because of its sweetness and taste, it is used in lots of recipes such as cakes, puddings, cookies and lots more! Banana smoothies is also one of my favorite smoothies and lots of people also share the same sentiment. But aside from its sweet taste, banana also has many health benefits in them. You will be surprised how much nutrient these yellow fruit has in them. Banana is fruit that can help you avoid cardiovascular diseases such as atherosclerosis (narrowing of blood vessels due to cholesterol plaque build up ), stroke and high blood pressure. High potassium level in banana is essential to maintain normal blood pressure and heart function. It is able to help prevent high blood pressure and subsequently reduces stroke risk. High fiber content in bananas is also very important in lowering cholesterol level in our blood by binding it and taking it out of our body and will help to prevent high cholesterol from developing in our body. You would notice that one single piece of banana contains a whopping 25% of Recommended Dietary Allowance of the Vitamin B6. 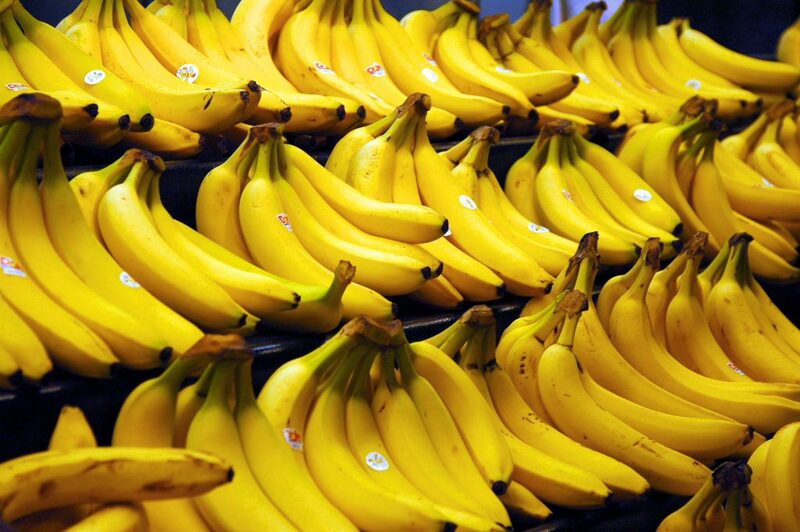 It means just eating 4 pieces of banana can give you 100% of Vitamin B6. It’s a really great way of getting the vitamin but what exactly Vitamin B6 does? Vitamin B6 is needed by our body for many reasons. It is needed to produce hemoglobin (red blood cells) and also help with metabolism of carbohydrate to maintain our energy levels at all times. Another truly important usage of Vitamin B6 is in production of neurotransmitters in our brain such as GABA, Dopamine and Serotonin. These are all very important chemicals for our brain and nervous system. Not getting enough of these can lead to multiple symptoms such as depression, lack of energy, loss focus, mental fatigue and anxiety among others. Basically these chemicals will affect our mood and energy level mentally. So, make sure you are eating enough Vitamin B6 to have a healthy life. 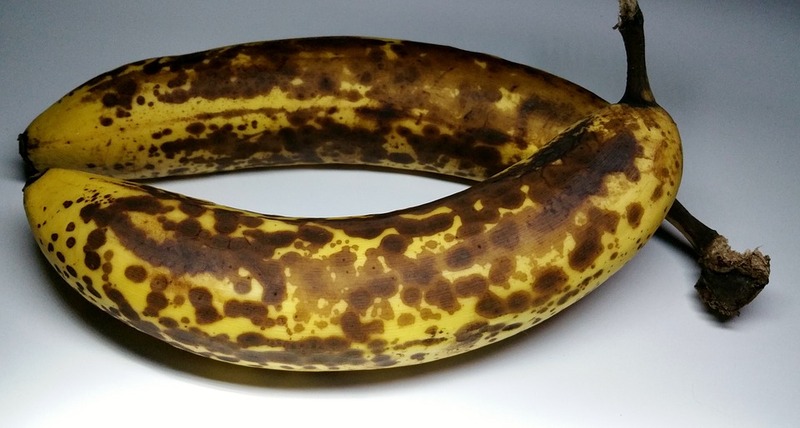 A well ripe banana with lots of dark speckles on its skin. Notice that the banana is still firm and can still stand on its own. How To Know If A Banana Is Ripe Or Not? This is something that more people need to understand. Ripe banana will have a much tastier taste and less starchy. It will also be sweet, and that is good either to eat it or to make any recipes (especially smoothies!). If you use an unripe banana, the sweetness will not have built up properly so what you will get is a starchy and plain tasting fruit. I’ve tried that before and it really taste awful! 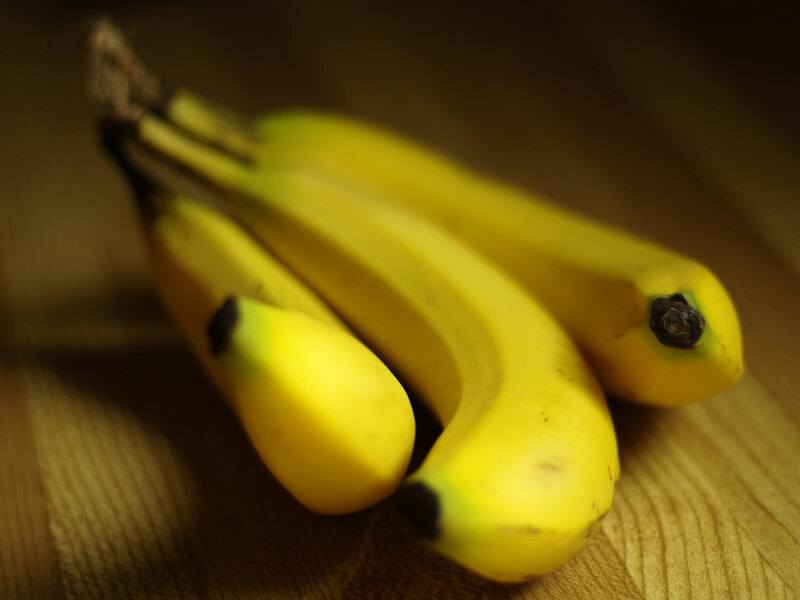 A general rule of thumb is a ripe banana will have lots of dark brown speckles on its dark yellow skin. Most of the bananas on the stores are sold in its young phase – bright yellow or light green skin with hard green stems. These are very young bananas and they are not tasty at all to eat! If you peel it, you will notice the banana is stiff, hard and pale in color. You won’t like the taste as it is very plain. You have to let them ripe first around room temperature (do not put them into the fridge as the cold temperature will stop the ripening process). After a few days, the color will turn to dark yellow. 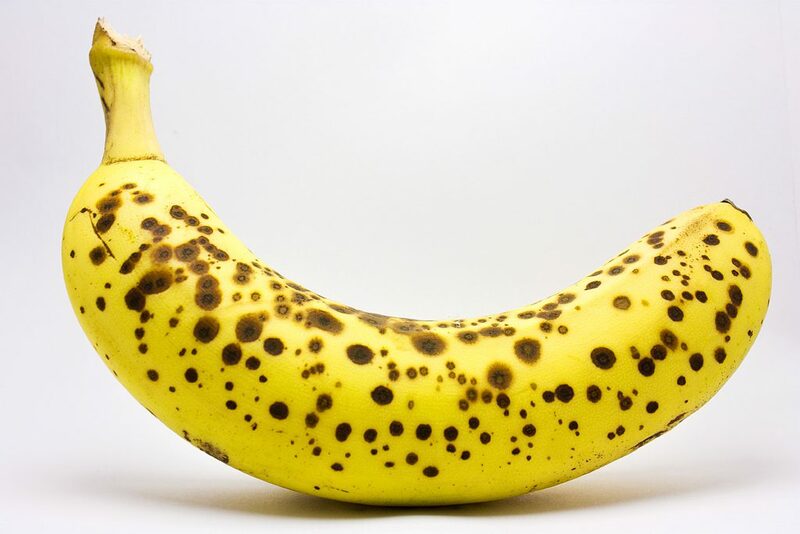 Wait for some time until you noticed lots of dark speckles (visit this amazing site for more information on banana ripening process and other interesting facts about this fruit) on its body. Now is the time to eat it or make lots of delicious smoothies with it! The banana will be tender and have a vibrant yellow color that is just very pleasing to eat. The starch has turned completely to sugar giving the sweet taste and suitable to be consumed. In any doubt, remember my own smell, color and ease of plucking test. A ripe banana will be 1) have a sweet banana smell, 2) yellow color with lots of dark speckles, and 3) very easy to be plucked from its branch. An unripe banana will be 1) little to no smell at all, 2) very bright yellow color, and 3) hard to be plucked. I would recommend for you to freeze these ripe banana immediately because if you let it ripe more, it is going to go bad soon. A banana gone bad will feel squishy, mushy looks very dark and you won’t even think of eating the flesh. Freezing the banana at its ripest stage will allow you to use it at a later time not too mention you don’t have to add any ice if you are using a frozen banana for your smoothie. As you surely must know, banana’s ripeness is very short lived. One time they are sweet and smell really nice to eat. And just a day after that it well totally squishy and not very enticing to eat. What I’ve found from my experience with banana (I eat and drink banana smoothie at least once a week – the so called banana lover =p) it is better to hang it rather than putting it on a table. 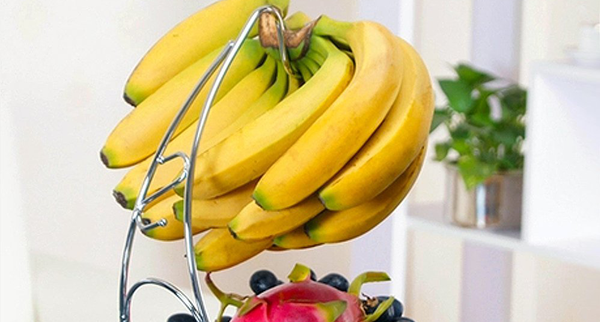 By hanging banana (by a rope or on a hanger) we can avoid the direct contact of the bottom of banana to the hard surface of the table. Since a ripe banana is very soft, this direct contact will crush that portion of banana. Many times I’ve had some bananas that feel squishy and become black at the bottom. It’s totally because of this. So I recommend all of you to hang them while waiting for it to ripe. 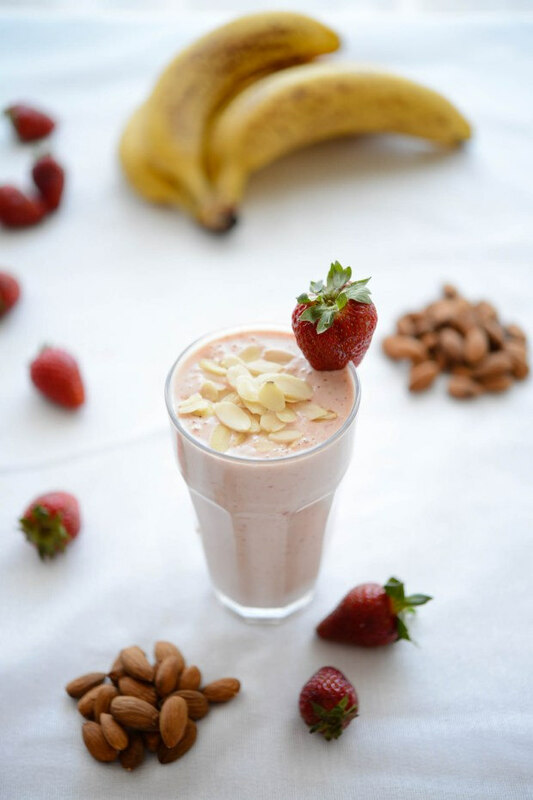 Below are some of the healthy banana smoothie recipes I’ve gathered. A bit of disclaimer, all these recipes are not originally my own as I’ve taken the inspiration from some websites. The link to the original recipes are provided next to the recipe name. This is a quick and easy banana pineapple smoothie. Only 3 ingredients are needed to make this tropical smoothie goodness. Put all the ingredients into your blender and blend until everything has been pulverized. Add some ice before blending to make the smoothie cold. You can also freeze the fruits beforehand. A delicious smoothie based on apple and banana for you to try. The cinnamon, walnut and swiss chard will add up to some of the flavor while giving you enormous health benefits. Add all ingredients and some ice to your blender and blend until smooth. What do you get when you combine banana and blueberries in a smoothie? A very delicious drink that is filled with the antioxidants that your body loves! Put everything into a blender and blend until smooth (usually less than 1 minute is enough as the fruits in this recipe is not that hard to be pulverized). Add some ice before blending to make the smoothie cold. You can also freeze the fruits beforehand. Put all ingredients into a blender and blend until smooth. A blending cycle of 1 minute or more might be needed to totally blend the leafy green though it will depend on the performance of the motor. A high power motor will only need 1 minute to produce a silky smooth smoothie with leafy greens. Do You Have The Right Blender For These Recipes? Recipes are one thing, but do you have the right blender to make it? Fruits smoothies (such as the banana blueberry smoothie) are generally easier to blend and can be done using normal blenders. But recipes that use leafy green vegetables (like recipe no.4) and nuts/seeds (recipe no.2) will need some serious blending power to thoroughly cut through all the ingredients for that silky smooth smoothie. A normal blender will never be able to do that. Check out these recommend blenders that will give you that high performance blending power that you need. 1- Vitamix Professional Series 750 – New cutting edge blender from the Vitamix brand. I hope you have gained some insight on how good a banana is for your health. Do try some of the recipes and give your feedback below. Any questions are more than welcomed. Thanks for reading and cheers! Previous Post: Cleanblend Commercial Blender Review – A Cheaper Vitamix 5200 Clone?